Welcome whippet enthusiast! If you enjoy reading about the winsome and whimsical whippet, this is the place to be. My poems here are just a handful from my whippet poetry library. Additionally, you can read a brief and colorful summary about the whippet's distinguished history and glimpse into an ancient time to a modern era of whippets in art. To view poems and information, click on links. with graphics may not load on center or properly. "I am on now Facebook, so please come visit"
"Click on symbol or link below"
The sleek and slender whippet is a member of the sighthound family. Several sources have shown and revealed the earliest date of the whippet's existence as far back as to the time of Ancient Greece and even at the time of Egypt when it was ruled by the Pharaohs. 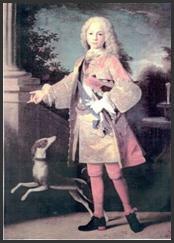 Evidence has clearly shown that whippets were owned by royalty in Europe during the 15th and 16th centuries. 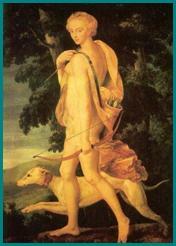 The whippets modern origin and documentation dates back to the late 18th century. The first whippet was registered by the American Kennel Club (AKC) in 1888. The breed was mainly used for purposes of hunting small game and the sport of racing. 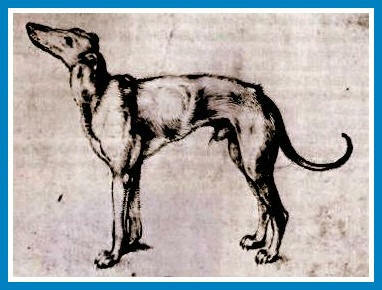 the whippet was once considered a poor mans racehorse, other names given were "snap dog" and "rag dog". This whimsical whippet was derived from the crossing of the English greyhound, the Italian greyhound and the terrier breed. In the modern era, the whippets status and talents include racing, lure coursing, competing and placing in prestigious dog shows and becoming a family pet. The whippets intelligence, demeanor, and independence constitute for a very charming and captivating friend and companion. Its elegance, gait, strength, and incredible speed simulate poetry in motion. Whippets are very photogenic and have long been seen in and subjects in various artworks such as classic paintings, vintage photographs, sculptures, tapestries, and ancient wall carvings. Additionally, they have been written about in many stories and poems. The whippet's historical and artistic presence has emanated from all walks of life, from royal kings and queens to the modern day artisan. that would be the greyhound and the whippet. Copyright 2005-2018 The Whip-poet. ALL RIGHTS RESERVED. Reproduction of any part of this site, or its contents, in any form is strictly prohibited. All rights to the poems on this site are owned by the authors. Absolutely no poems on this site are available for download or public domain. 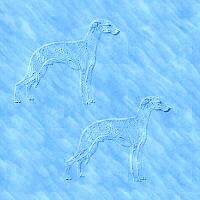 To WHIPPERCLIPPERS, for some of the outstanding whippet clipart, and to Gorgeous Gifs, for the unique and creative whippet backgrounds .